Set up a long rope from tree to tree, next to and across stream or suitable river. Include as many obstables as you like, tunnels, over and under, dangly bits etc. Blindfold each team member – they then have to navigate rope without removing blindfold. They can either stay close, within calling distance or they have to stay linked somehow (by holding shoulder for example). 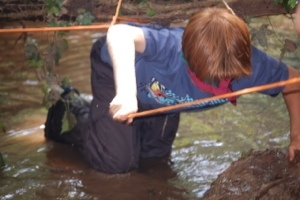 Posted by clivegrant on 28/03/2013 in Challenge, Water games and tagged blindfold, course, outdoor, river, rope, stream, team, water, wet.